I know I'm ussing a lot of technicality here, but ey, it works. Grimgrin is a mass of bodys, but who said they weren't recently murdered? Who said they weren't what all remained of the Cencani family, that Geralf wasn't insane enough to take his family, murder some of them, and fuse them all together? And who says that one person, his great grandmother, therefor related loosely to Grimgrin (of whom has no specified family) survived the mass-murder? 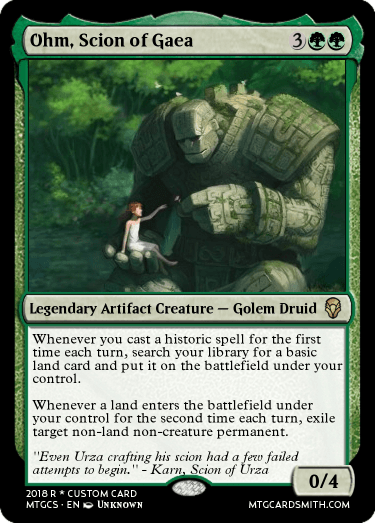 And following my usage of technicalities, as far as artifacts go, this would be Karn's artificial golem brother. 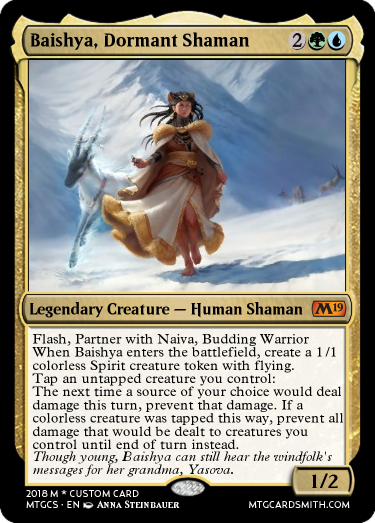 Okay... this entry is probably HUGELY unbalanced, which someone will tell me in the comments section below the card and I'll be unable to respond to, because I don't have Disqus. Ah well, here goes nothing. This is Ava, she's Zurgo Helmsmasher's sister. Rebellious and adventurous, Ava was always getting them both into trouble when they were younger. Rather tragically, Ava does not exist in the new timeline since their mother was devoured by Kolaghan shortly after giving birth to Zurgo. So this version of Zurgo doesn't even know his sister exists. Cryx is the child of everyone's favorite gigantic scarecrow monster, the Reaper King. I say child... the Reaper King made it using bits of other scarecrows. Now it haunts the world, tainting everything with its terrible touch. I've fixed Leonna from page 1. 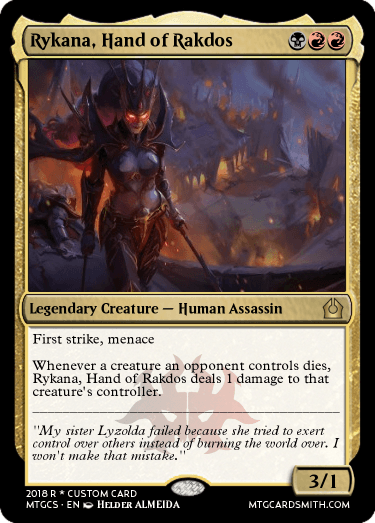 @Fallen_Lord_Vulganos I love the fact that you made a sis for Jace but it has to be a LEGENDARY CREATURE. 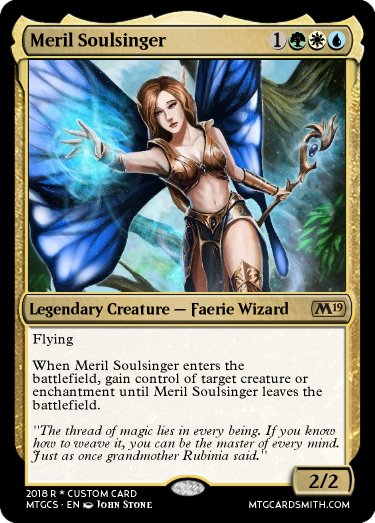 if you could make her into a legendary creature card that would be awesome. 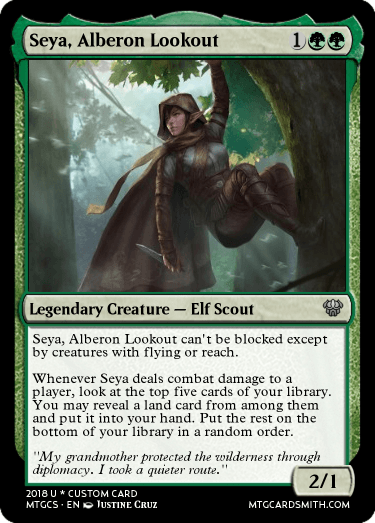 I say this because you have to mention the family in flavor text. Should upload it to the brothers from other mothers. Also a tribute to @saveria201, one of this site's best cardsmiths. 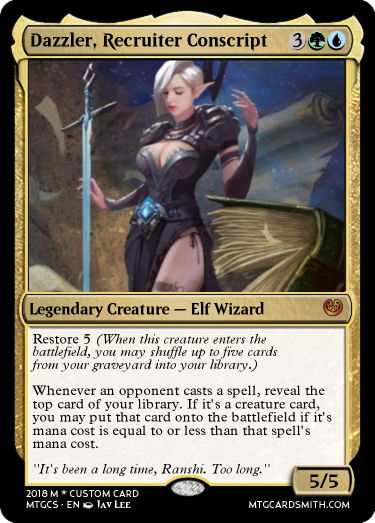 Here, a lost sister of a certain mind mage we all know. @Dechujoh64 Ok it's a creature now. @Dechujoh64, here is Vorel of the Hull Clade's brother. 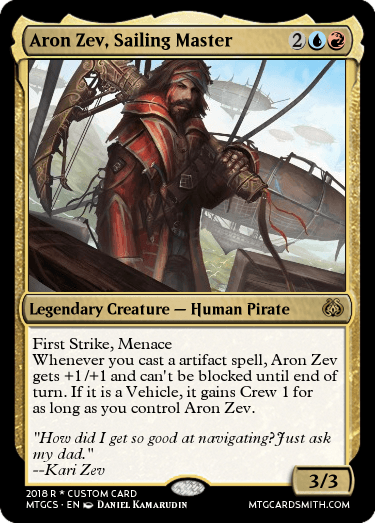 My first commander deck was Vorel, so he has a place in my heart. I tried to make his brother a card with a similar call-back effect and a unique spin. Hope you like it. @Dechujoh64, here is my second entry: Tasigur's father! 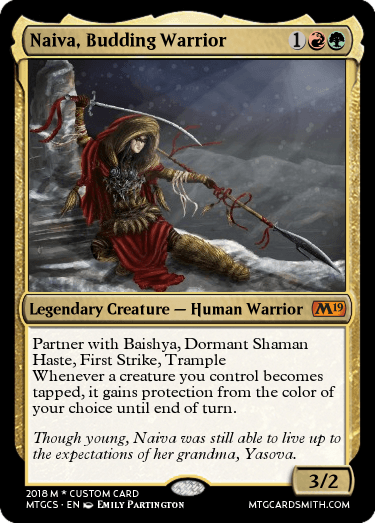 You never see Human Angels in the game... so to have a character such as Dahlia who learns that Iona is her mother, she becomes driven to step up her involvement on zendikar to live up to the bloodline she is a direct descendant from. 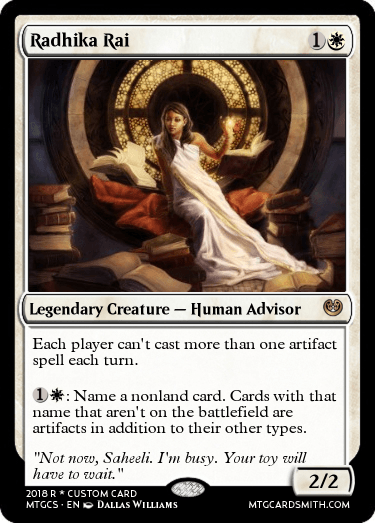 She helps maintain order in Zendikar as much as she can when she can. 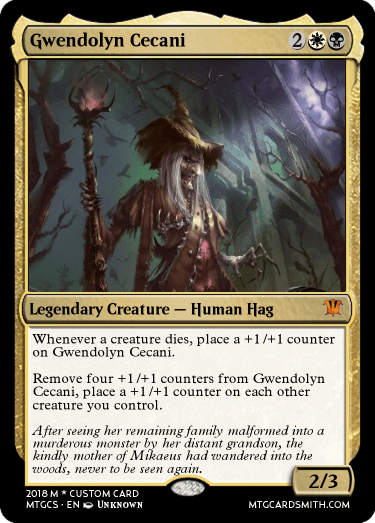 Her mother while very powerful, was unable to stop the colorless eldrazi's reign of terror. 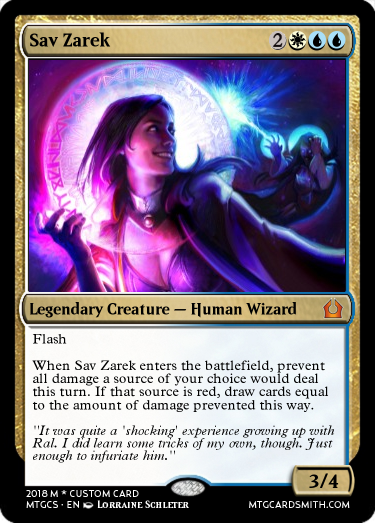 Her daughter has her mother's intuition however, and will do anything she can to slow the eldrazi's down from utterly destroying Zendikar. 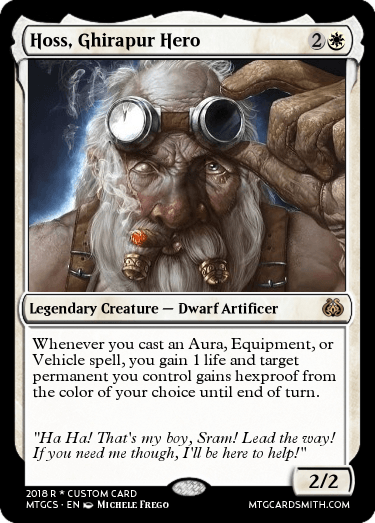 Hoss is Sram's father, but respectfully retired (more like forced into retirement, but that's another story for another time). Sram took Hoss's place in the community of Ghirapur at a young age, and has lead them through many trying times. The events that are happening in Ghirapur currently however are pushing his father Hoss out of retirement, however much it may annoy Sram. Hoss is wise and extremely equipped to deal with many situations in battle, but Sram is concerned about his Pop's health and well being. The problem is that Sram is also is in a bind, as he needs as much help as he can get, and Hoss has the experience that Sram needs to help him in the battles that are happening now and the ones that lie ahead. Saheeli's mother, Radhika, was a very learned scholar and philosopher. She didn't care much for the material world. And that included Saheeli's creations. Her lack of enthusiasm, however, was what spurred Saheeli to become better and better at her craft, in the hope that one day she would impress Radhika. As for the card, I wanted to combine the casting restrictions of Eidolon of Rhetoric and Ethersworn Canonist with the clever manipulation of Eight-and-a-half Tails. Ended up with this. Has applications against dump-your-hand artifact decks like Affinity, Lantern, and KCI, all of which it slows down, while being able to delay the likes of Storm and Elves with a bit of work. 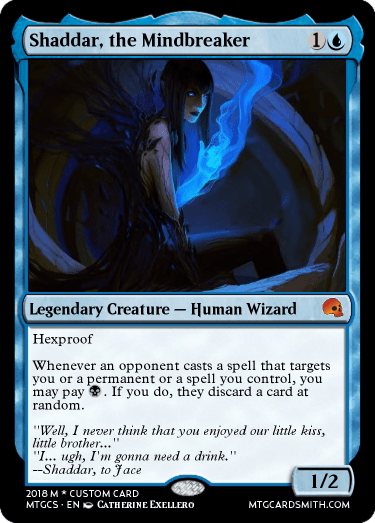 Tezzeret built Vexis long ago. The Aether liches of his home plane of Esper inspired him to create a his 'son': a construct harboring a sliver of his life essence within it. 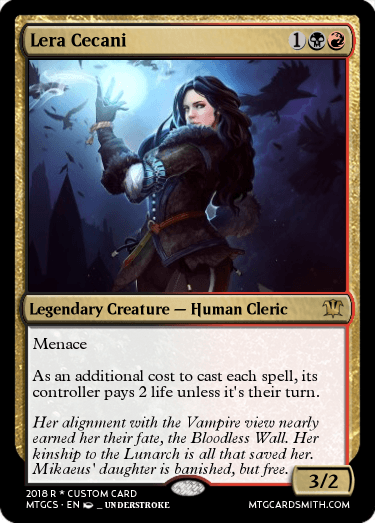 Animated and empowered by the piece of Tezzeret's soul within him, Vexis has power over the dead and a single mission: to defend himself from harm so that Tezzeret might go on to live forever. Placed on a distant, deserted plane, far from harm, Vexis is the ultimate backup plan and a son loyal to the end. @Undead why does your cards lore remind me of guardians of the galaxy 2? lol. Except in the movie its a whole planet. To determine the total cost of a spell, start with the mana cost or alternative cost you’re paying, add any cost increases, then apply any cost reductions. The converted mana cost of the spell remains unchanged, no matter what the total cost to cast it was. A granddaughter of a certain faerie from Legends.